How do people of a certain age discover new music? It’s easy enough when you’re young. Your friends, classmates and work colleagues will tell you all about the groups and artists they like and vice versa. But it becomes harder as you grow older. You tend to socialise less and stay at home more. And you find, at least I did, that most conventional radio stations play music that appeals to listeners half your age at most. You can of course read the music magazines. I subscribe to Classic Rock, and it’s been instrumental (groan!) 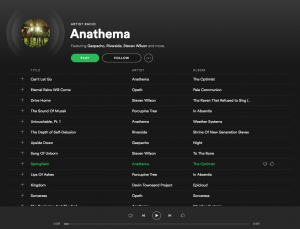 in bringing to my attention some of my favourite current bands like Anathema and Band of Skulls. But these publications aren’t cheap and inevitably much of their content will be irrelevant to you as it’ll be about performers you’re not especially fond of. Then there’s the Internet, but where to start? Well, let me give you a tip that won’t cost you anything. Most of you will have heard of the music-streaming service Spotify. Its Premium plan costs £9.99 a month, less than the cost of a CD, and gives you unlimited access to more than 30 million tracks that you can even download to your computer or device. It’s well worth the outlay in my opinion. But if you aren’t fussed about downloading and are prepared to put up with ads and lower quality audio (160Kbps compared with Premium’s 320Kbps) you can use Spotify free, gratis and for nothing. Spotify learns from your listening habits. It suggests music it thinks you may enjoy based on your choices so far, and even puts together daily mixes similar to the genius playlists you get on iTunes. There’s also Discover Weekly in which the site offers you a “mixtape of fresh music” every Monday with “new discoveries and deep cuts chosen just for you”. These playlists can be a bit hit-and-miss, but here’s a trick I learned that increases the chances you’ll like the recommended music. Play an album by a favourite artist, or just the last track, but don’t stop or pause it when it reaches the end. If you allow play to continue, Spotify enters “album radio” mode. While essentially this is also a playlist in my experience it will more accurately reflect your taste by combining songs by that artist and, crucially, others similar to it. You can even refine the “radio” by giving individual tracks the thumbs up or down. Now, that truly is music to an old codger’s ears. Next Next post: Airport talks taking off?